Temple Beth David is a Reform congregation founded more than 50 years ago. In 1961, a small group of Jewish families dreamt of a congregation that had the warmth of a family. As the families organized and word spread, the congregation grew to 60 families. Initially Shabbat services and the religious school were held at a church, and High Holiday Services were held in a catering hall. But just two years later, the congregation purchased its first home – a split-level house on Scholar Lane in Commack. 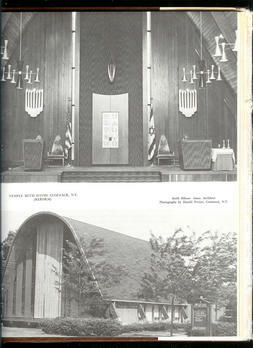 In 1971, Temple Beth David moved to its present location on Hauppauge Road in Commack, and its first permanent sanctuary was dedicated. In 1985, a new sanctuary – built to accommodate the growing congregation – was dedicated. This is our current sanctuary. As Temple Beth David evolved, so did the community. Our members, clergy and staff have worked hard to develop new programs for the congregation and community at large without losing the temple’s identity as a Jewish family community. Despite the many changes, one aspect of our temple has not and will never change. We will always treasure the spirit of closeness, warmth, and haimishness – that feeling of family – on which Temple Beth David was founded and our congregation thrives.